Note the prop is clear of the water completely sat at rest. Built Built 2004, little used and stored ashore in a Boat shed for several years, she looks VERY much younger Than she is. and the tubes look in excellent order. Engines Mercury Optimax "Saltwater" 90,hp engine, two stroke Outboard motor with full Powertrim / tilt etc, according to mercury's own website this engine should be burning a touch less than her Four stroke equivilent. Tanks Built in Tank forward, capacity awaited.. Berths She will seat 5/6 underway..
aft hull guide wheel roller set up, makes life very easy. lockable bits box on trailer super handy. 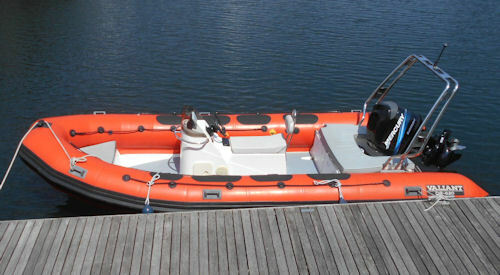 very able Rib, in stunning order, well worth a look, perfect for running around the Solent. which says this engine should burn 29l/hour at WIDE OPEN THROTTLE, !! OR 13.5Lts at 4 ,000 RPM, which should be cruising Nicely..
but still it works out slightly cheaper. when fuel is £1.25/Lt at garage.